Here are photos of Cotswold Ensemble String Quartets, String Duos & Solo Cellists at special events, balls and parties. Our "Guides for Brides" gallery also has photos of us performing live at weddings and receptions. Our Cotswold Ensemble Pinterest page has even more photos of us in action. Wedding & Reception at Stonehouse, Glocs. Lords of the Manor, Upper Slaughter, Glocs. Wedding & reception, Bay Tree Hotel, Burford, Oxon. Pre-dinner drinks, Wishanger Manor, Glocs. Company Christmas dinner, King's Head Cirencester. Wedding at Christ Church cathedral, Oxford. 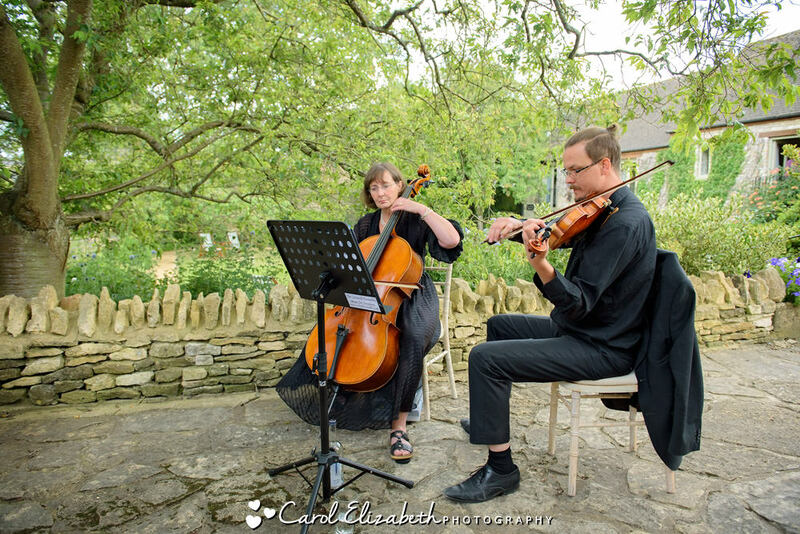 Cotswold Ensemble String Quartet, Cripps Barn, Bibury, Glocs. wedding at Parley Manor, Hampshire. Oxford College garden wedding reception. Wedding reception at Rushey Meadows, Oxon. Cotswold Ensemble String Quartet at Oxford Town Hall. Cotswold Ensemble String Quartet: wedding at St Edmund Hall, Oxford: where the bride joined in! Green clothes in evening shadows at a Green Ball near Wallingford. Reception at Woodchester Mansion. Photo by Claire Lau Photography. Calm concentration by the Cherwell at Wolfson College, Oxford.